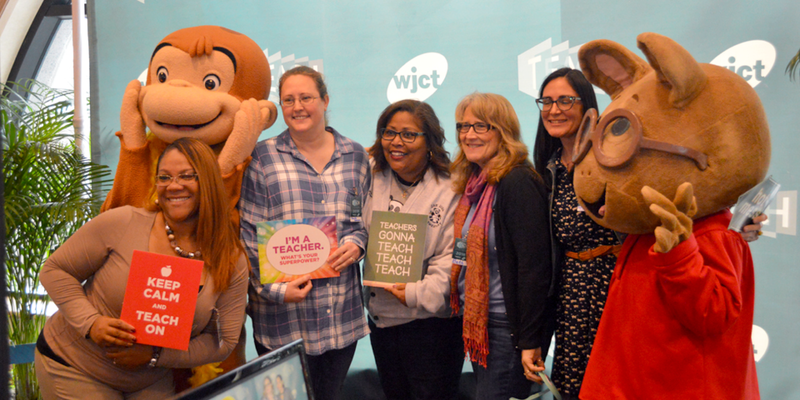 On March 2, 2019, WJCT held the 6th annual TEACH Conference, an event created to engage, empower and inspire teachers! 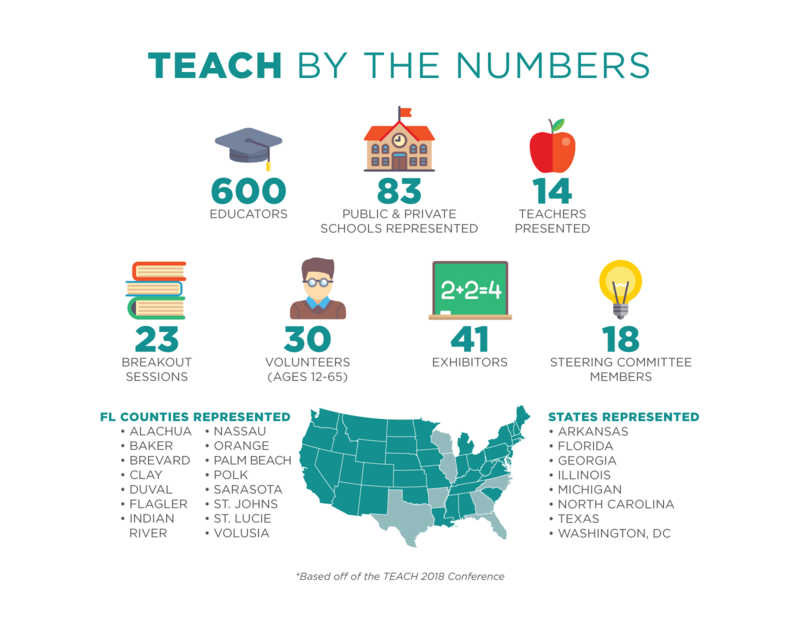 TEACH 2019 was held at the Hyatt Regency Riverfront in downtown Jacksonville, Florida. Educators spent the day meeting and sharing ideas with fellow educators, learning new ways to engage students, and empowering themselves to further inspire others. Were you a Florida Lottery Bright Futures Scholarship Recipient? 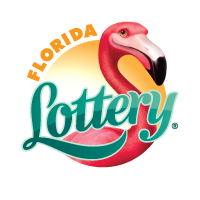 If so the Florida Lottery would like to film your story on Saturday! Sign up below to stop by the Florida Lottery booth and tell your story. Sign up now to try the newest Massage Envy service, Rapid Tension Relief, at TEACH 2019! Come on, you’ve earned it! TEACH: Better Together is seeking creative, innovative, and informative sessions for our 6th annual conference on Saturday, March 2, 2019. Breakout session proposals will be accepted until 5PM on Friday, January 4, 2019. The submission period has ended. Check back soon to see the breakout session line up for 2019. For more information, contact Circe LeNoble, Grants & Education Outreach Manager at clenoble@wjct.org or 904.358.6329. On March 2, 2019, WJCT held the 6th annual TEACH Conference. To see all the fun that was had at this year’s event CLICK HERE! So what is a TEACH conference day like? At morning registration, attendees receive their name tag, submit their ticket stub to enter to win an iPad and are given a professional gift bag. Bags are filled with educational materials and gifts provided by local sponsors. During the continental breakfast, attendees review their programs and choose the breakout sessions to attend for the day. Attendees have time to visit the sponsor booths, discovering new educational resources for teachers and students. Next, attendees convene in the Grand Ballroom for a welcome from David McGowan, President & CEO of WJCT, and our Honorary TEACH Chair. Their remarks are followed by the morning keynote speaker. Last year’s morning keynote speaker was Pedro Noguera, Expert on Public Education in America. Other morning keynotes have been delivered by Mary Ehrenworth, Lucy Calkins, Barnett Barry, and Marcia Tate. Following the morning keynote presentation, everyone heads to breakout sessions of their choice. These 50 minute sessions cover a multitude of topics—keep including gender specific teaching techniques, technology, communicating with parents, bullying, curriculum tools for core subjects, integrating arts, and many, many more. Keep watching for upcoming details. Sessions are presented by educators and professionals and cover topics that are important to classroom and professional development. Attendees enjoy an elegant sit-down lunch with festive decorations adding to the celebratory atmosphere and providing an opportunity to make new friends and connect with colleagues from your school or cohort. Following the lunch, it’s time for another round of breakout sessions and visiting the sponsor booths. The day ends with an afternoon keynote speaker (TBD). Previous afternoon keynotes have included George Couros, Drew Dudley, Brad Cohen, Ron Clark, and Kim Bearden. And, last but not least, we’ll top off your day with a special treat and terrific door prizes donated by many of the sponsors. Previous prizes have included iPads, classroom book sets, curriculum materials, and gift certificates. Don’t believe us? Come to TEACH and see for yourself! Teachers love TEACH! Click below to watch a brief recap of last year’s event, and hear from teachers just like you on being engaged, empowered, and inspired at TEACH 2018.